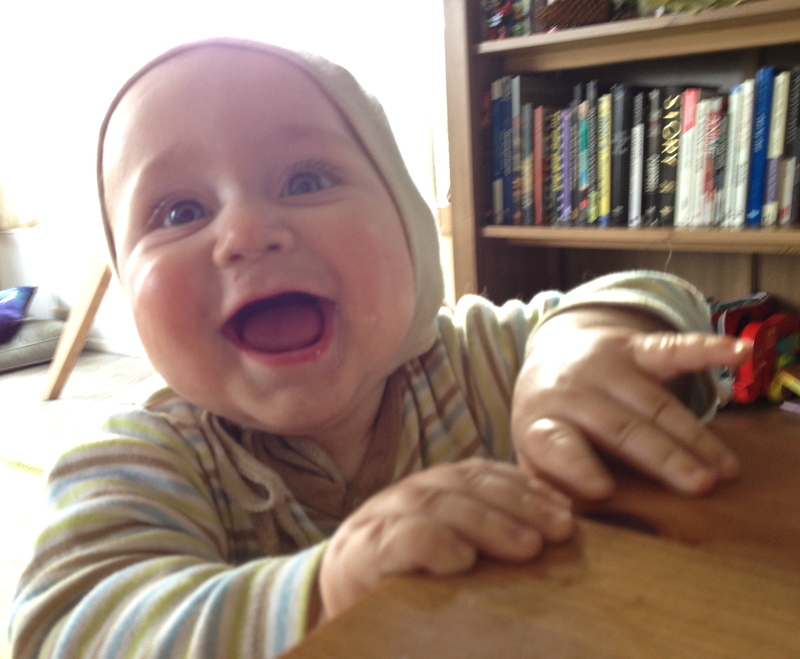 Lately, I have been thinking about how I should address my Son with all of his growing skills, like crawling or waving. It IS amazing to watch him do these things, but is that a sentiment I should share with him? I watch him crawl around all over and act in developementally advanced ways for his age, and listen to people around me tell him how “super” or “amazing” he is and somehow, all I feel is the need to protect him from this pressure. I just want to scoop him up and tell him I love him no matter what he does! When he crawls, or if When he throws a fit when I wipe his nose, he is still amazing to me. In Magda Gerber’s book, Dear Parent: Caring for Infants with Respect, she has a chapter on this very subject. There is a chapter on Praise or Acknowledgment in which she says: “Occasional reflections reassure the infant of our full attention and show our empathy. Rather than to give praise, the adult can be a broadcaster and describe the child’s actions.” Children do not have a need to be “amazing” or “wonderful”, they have a need to be SEEN. Instead of “Look at how great you are standing up all by yourself,” we can say “Look at you, standing all by yourself.” It is such a subtle shift by a paramount one for your little one. “The commonly used “good girl” or “good boy” often becomes mechanical and subtly demeaning. It implies the child’s value as a person is contingent on his “performance.” It can create a conflict for the child. He may think he acts “bad” if he acts differently from whatever has just been praised as “good.”” What starts as a well-meaning and innocent show of love for our children, becomes, later in life, a complex of which much counseling may be needed. There are so many adults these days that feel inadequate when they hold normal, “boring” jobs and perform mediochre life tasks. Our value does not have to be in WHAT WE DO, but WHO WE ARE. Perhaps, with practice, we can learn to acknowlegde the good AND the bad, get rid or praise and reprimand, and simply help our little human being feel “seen” in the world. What do you think of praise vs. acknowledgment? Do you feel that criticism and praise affected who you are as an adult? Next Next post: Children LOVE Veggies Straight from the Vine! The Gift of Sleep: Our Story of Respectful Sleep Learning.